Pemphigus vulgaris is an autoimmine disorder, where the body's immune system attacks some of the proteins in the skin. 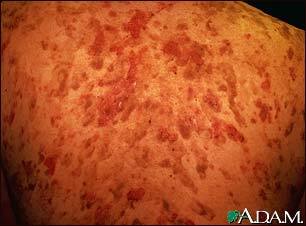 Pemphigus usually occurs in middle-aged or older people. This picture shows a close-up of the blistering on the back. Most of the blisters have broken (denuded), which is common since these blisters are fragile.